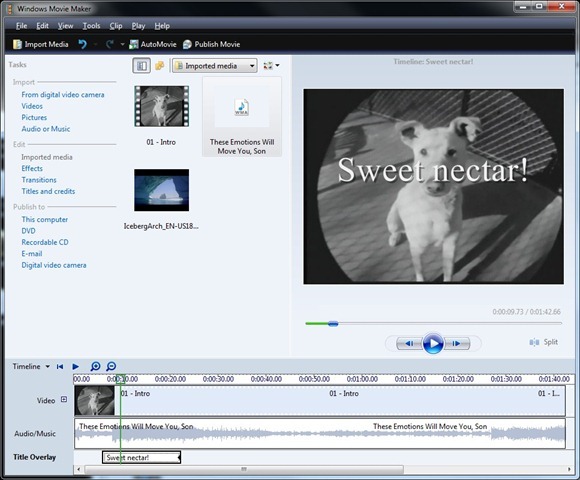 Opinions have differed over the years on the Windows Movie Maker line, but it’s a capable enough product. You’re not going to be creating cutting-edge media with WMM, but for the cost (free), well… you get what you pay for. 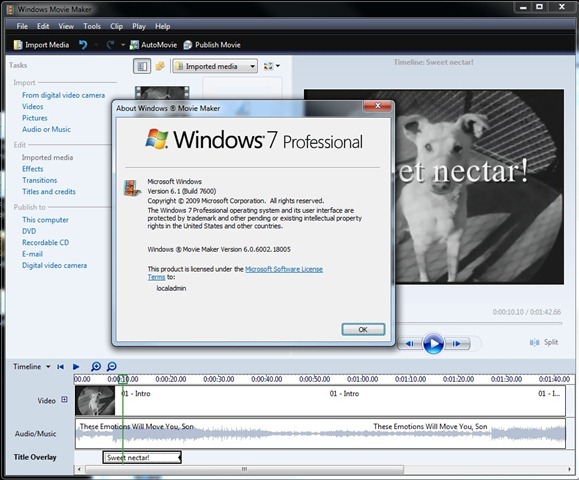 There was some excitement when it was announced that Windows 7 would have access to an entirely new, refreshed version of Windows Movie Maker. I say “have access to”, because the new version – Windows Live Movie Maker – would, instead, be a separate download – along with Windows Live Mail, Windows Live Photo Gallery, Windows Live Writer, and a few other things. Certainly leaving some of those *core* products out of Windows 7 wasn’t everyone’s favorite decision, but it keeps the OS slimmer & trimmer. That’s a good thing. 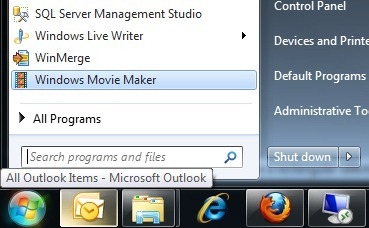 Sadly, the new Windows Live Movie Maker is probably not the follow-up that most folks were hoping for. While it does utilize the updated ribbon bar interface, which is nice, most of the improvements end there. The ever-usable “timeline” view is gone, taking a “picture from a preview” is no longer offered, and the ability to manually “stretch” objects out to adjust the timing has been replaced with manually typing in values. It’s too bad, too, because the updated Windows Movie Maker could’ve really hit it outta the park, but the more I use it, the more I find things that I cannot do that I used to be able to. Thankfully, there is some good news. For starters, WMM 2.6 is available for download, and seems to work just fine on Vista or Windows 7 – both 32-bit and 64-bit. 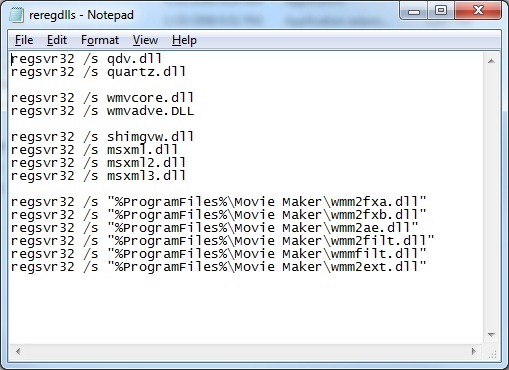 Even better, the WMM version that was updated for Windows Vista (ver 6.0) works on Win7 as well, provided you download the proper version for your OS, and then run a simple batch file. 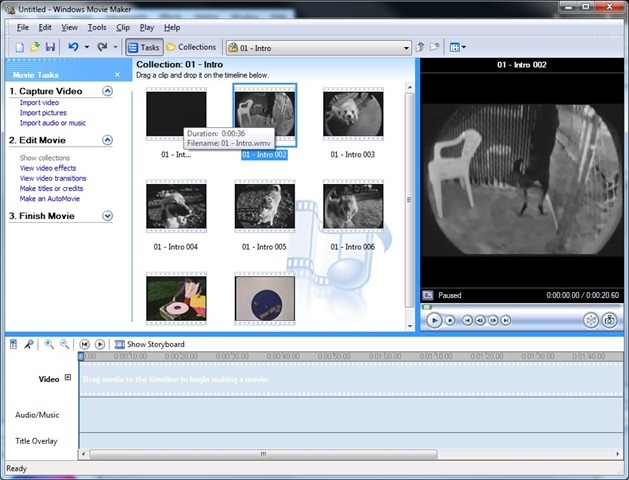 Version 6.0 (released with Vista) included new effects and transitions, support for hardware acceleration, and some newer file formats. Also, the UI is a refreshed & improved version of the WMM 2.6 interface. Let’s take a look at installing that. 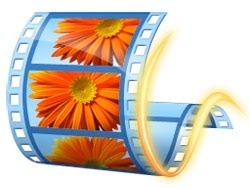 Open the “Movie Maker” folder that you just extracted. Right-click on the “reregdlls.bat” file and choose to “Run as administrator”. Choose ‘yes’ when prompted and allow the batch file to run. It should only take a moment. 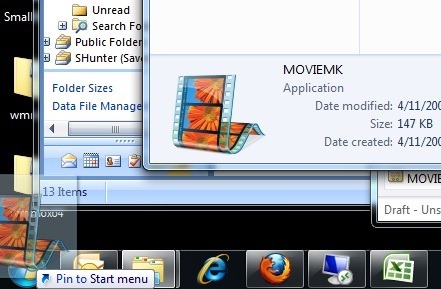 Finally, left-click on the “moviemk.exe” file and drag it onto your Start button to “pin it to the Start Menu”. 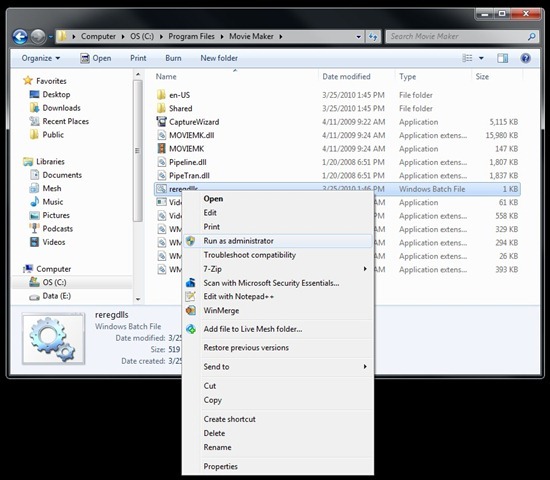 Open the Start Menu, click on “Windows Movie Maker”, and go! 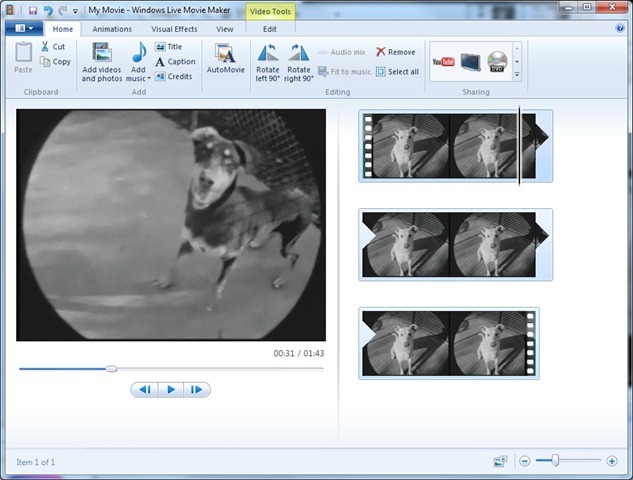 Although both versions of Windows Movie Maker (2.6 and 6.0) can function along side Windows Live Movie Maker just fine, it appears that the 2.6 and 6.0 versions stomp on each other somewhat. I recommend that you choose just one of those versions to have running on your Win7 system – with 6.0 being the better of the two. The 2.6 (XP) version works fine on Windows 7, but seems to have a few issues – either by design, or by running on an OS that it was not intended for. For instance, the “collections” view won’t show your imported video files – those have to be selected directly. Also, importing video files takes quite a while, and then breaks them into “chunks” rather than the whole video file. The 6.0 (Vista) version is obviously not intended to be ripped from Vista, so your experience under Win7 may vary and/or be problematic. Haven’t heard of any issues, though. Finally, a special thanks to this forum for pointing me in the right direction! 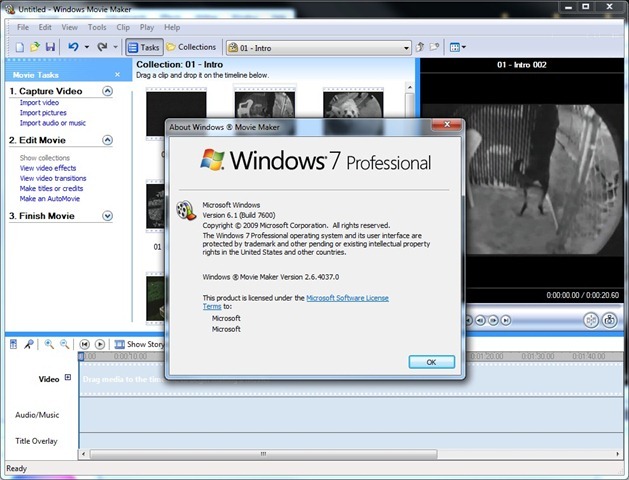 Hope you enjoy using Windows Movie Maker on Windows 7! Microsoft recently released their 3rd generation Zune media player – the Zune HD. Whereas the previous Zune players relied upon d-pads and squircles to move around the user interface, the Zune HD is full multi-touch wonder, and it is very well done. In fact, if it weren’t so pretty, you might almost say that it’s over done. It’s almost embarrassingly schwanky and fun-to-use. But let’s dig in to other items first. 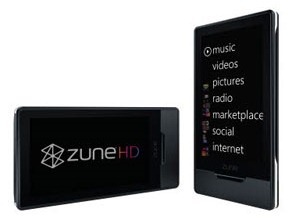 Current pricing for the Zune HD is $219 (US) for the 16GB version, and $289 (US) for the 32GB version. While that pricing is competitive and slightly cheaper than the similarly equipped iPod Touch devices, it seems like a better choice would’ve been to totally undercut Apple on this point. Also, I know that memory is sold in particular quantities and sizes (8GB, 16GB, etc. ), but why can’t they figure out how to release different memory sizes for these? For instance, a 40GB Zune HD that is comparatively priced to a 32GB iPod Touch would seem like a better value (to me) than being $10 or $20 cheaper. I should know if this is technically feasible or not, but I’m really not sure. You would think it wouldn’t be too difficult. The Zune HD comes in a fairly small and sturdy box. The top of the box slides upward to reveal the player, with manuals, earbuds, and USB cable packaged neatly behind it. If “unboxing” write-ups are your thing, then check out the Engadget article covering this. Honestly, though… it’s just a box. Before you ever even turn the device on, you immediately notice how little it weighs. Although 2.6oz doesn’t mean a whole lot to me on paper, it sure translates into a nice experience when you’re holding it. My recently-acquired MyTouch 3G phone isn’t exactly heavy, but there’s no doubt that the Zune HD weighs less. In fact, with the metal casing and glass screen, it just feels like a nicely designed & assembled piece of hardware. At least two of my iPhone-toting friends remarked at how nice the form factor is. It really makes the iPhone feel incredibly large. Zune phone anyone? Like most touch-enabled devices of today, the physical buttons are mostly absent. The top of the device has a rectangular Power/Sleep button that is flush with the casing. The left-hand side features a slightly bumped out Media Button that brings up the volume and track fwd/back controls, no matter where you are. Finally, the Home Button is placed just below the Zune logo on the front of the player. That’s it. No other physical controls are present. The bottom of the Zune HD is also where you’ll find the standard 3.5mm headphone jack and dock port. The back of the casing features a nicely etched Zune logo, your serial number (toward the bottom) and the obligatory FCC information, though very faint. The lower left-hand side has the words “hello from seattle” in very small text, something that every Zune has sported somewhere. The Zune HD comes with very typical earbuds (+ colorful foam covers) that I would never, ever use. They sound decent, or so I’m told, but that style of earbud absolutely kills my ears. I am continuing to use the Zune Premium headphones that shipped with my Zune 80. Otherwise, the only other hardware of note is the standard Zune port-to-USB cable. In my personal opinion, the “twist” interface on the Zune has been the best of any media player out there. The ability to move horizontally and vertically among your collection is both fun and easy-to-use. The Zune HD retains the “twist” tradition, while adding ‘touchability’ to the mix for additional control, shortcuts, and some pretty cool stuff. As an interesting aside, a good friend of mine was taking a look at my Zune HD. He noted that something (I don’t remember what) was not entirely intuitive on the Zune HD. It got me thinking. What is “intuitive”? Should all functions be readily apparent without ever having read a manual or having used a similar product? How low do you set the bar? These are interesting questions. 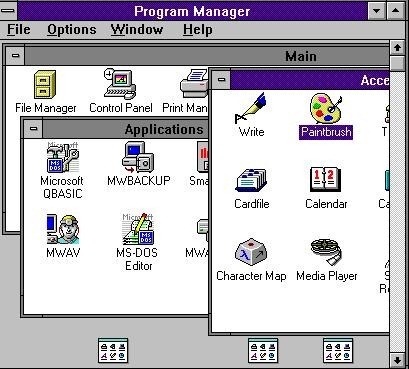 Microsoft has historically been *very* conservative and overly explanative with their interfaces. Windows NT 4.0 featured an arrow that flew across the taskbar, poked the Start button, and said “click here to Start”. It was fine for Grandma who’d never used a PC, but it was pretty ridiculous for the rest of us. These days, however, Microsoft seems to count on the fact that more and more people know how to use a computer, and thus can figure out most of the interface on their own. “Intuitive” is almost better stated as “consistent” – both with their own product, as well as other products on the market. 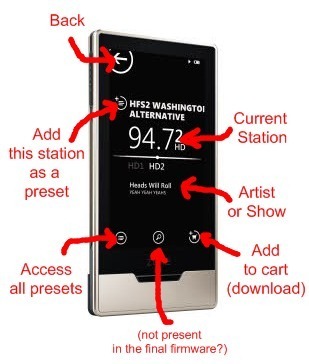 I read the Zune HD manual after the fact, but otherwise figured out on my own how to play music, use the radio, add a favorite in the browser, and scroll through pictures. To me, that means they’ve accomplished “intuitive”. The Zune HD now features a “wallpaper”, of sorts, which ends up acting more as a shade to what is going on behind the scenes. When you turn the Zune HD on, you are greeted with the (customizable) shade, the time, notification icons, and an arrow pointing up – which is the direction that you flick the shade to get the homescreen. As best I can figure, this shade helps protect the user from unnecessarily messing with the player while in a pocket or purse. If you happened to hit a button accidently, you would still have to flip the shade to do much more. A safety feature, I suppose, and a fun way to personalize your device, since the rest of the player only allows for the default black background. All that said, it seems like the swiping up motion to clear the shade is a bit problematic at times. It requires a fairly intentional swiping motion, and it occasionally not ready to be swiped after first turning the screen on. Here’s hoping these issues are remedied with a future firmware update. The homescreen is really broken into two main parts: the category list and the quickplay. When one part is made prominent, the other shrink down and off to its respective side. It’s really an amazingly clever way to give access to more functionality, without having to mess with an interface that is already known. homescreen: As you can see in my very awesome, custom graphic, the homescreen gives the ability to launch several things all from one place. Get used to this, because the Zune HD is all about having a lot of choices from various views. In this case, you can select any of the various ‘categories’ on the right-hand side, click on the ‘Play’ circle to begin playing all of your music, or you can click on the left-hand side ‘Quickplay’ area for access to a number of handy things. quickplay: The small quickplay area on the left becomes the prominent portion of the screen just by clicking on it. Actually, you can switch between the two main screens by either swiping back and forth, clicking on the respective side, or simply hitting the home button. They really want you to use the quickplay functionality, and you really ought to be. It’s wonderful! Back to the subject at hand, though, the quickplay area is broken into (at most) four sections: Now Playing, Pins, History, and New. The ‘Now Playing’ portion only shows when you return to the homescreen while you’re playing music, radio, or a podcast. It will show an album cover (or similar) of whatever you’re currently playing, along with ‘Playing’ or ‘Paused’ text above it. 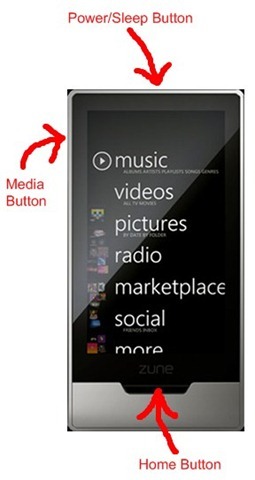 ‘Pins’ are like favorites for the media you have on your Zune HD. Like a particular album, artist, or genre? Pin it to your quickplay area where you can quickly get at it. You can also pin podcasts, pictures, radio stations, browser favorites, and apps. Nice! The ‘History’ area, as you might expect, shows media that you’ve accessed most recently. Finally, the ‘New’ section shows media that you’ve most recently added, which is great when you’ve downloaded a few new albums that you want to remember to listen to. music: Hopefully, playing music is the primary job of your Zune HD. After all, that’s where this device excels above all others in this category. Clicking on ‘Music’ from the homescreen whisks the word “music” to the top of the screen and zooms in, revealing your Artists view. From here you can scroll downward and roll through the artists, swipe side-to-side to get at playlists, genres, albums, etc., or hit a boxed [E] letter (see the photo) to bring up the full alphabet view where you can go straight to all artists beginning with that letter. It’s really a fairly ingenious (and fast) way of moving around, and yet retains the “twist” interface that Zune has used for years. It’s more of the same, but better. Not only that, but other items are immediately clickable from this view. Click the ‘Play’ circle next to an artist and begin playing all albums from that artist. Rather dig in? Click on the Artist name to get at their albums, pics, bio, and related. Finally, click on the top of the screen where the cropped ‘Music’ text lives to go back to the previous screen. 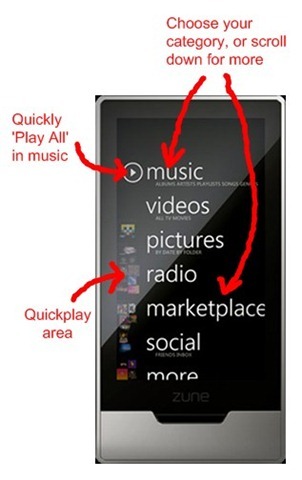 This is a consistent feature when moving around the Zune HD interface. While playing music, the ‘now playing’–type view has an astonishing amount of control. As you can see in the picture above, you have access to no less than 7 distinct functions all from a single view. What you actually see is certainly far less cluttered than my photoshopped screenshot, so you’ll need to imagine this without all of the red arrows and text. The ‘now playing’ view let’s you easily see the artist (bold), the album (just below it), the album artwork, the current song (just below the artwork), and the next three tracks coming up. You can also hit Back, toggle Shuffle and/or Repeat, and give the song a Rating, if you like. 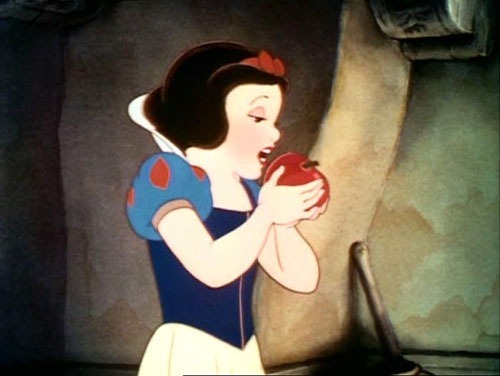 There’s more here than meets the eye, however, because much of what you see is also clickable. For instance, the Artist text will take you to the section for that artist. The area that shows the current + upcoming tracks will give you the full track list for that album (or playlist). Selecting the middle of the screen will bring up the Media Key functionality: adjusting the volume, or going FWD/BACK with your tracks. Wow! That’s a lot of stuff, and as with most Microsoft products, really just a number of ways to accomplish the same task. video: Strangely enough, I don’t (personally) spend a lot of time watching video on my Zune. Sure, I have the obligatory few DVDs I’ve ripped and some home movies, but nothing significant. Quite honestly, I use my Zune mostly for music. That said, there isn’t a lot that the Zune HD offers in video playback as compared with the previous Zune players – save for a beautiful, beautiful screen. That’s really the story here. Even with a smaller screen than the iPod Touch, I’m guessing that most folks would prefer watching the Zune HD and all its OLED goodness. The colors are richer, the viewable angles are far better, and (on paper) the video-playback battery life is longer. As you might expect, you can hit the Media Key to get on-screen playback controls during a video. Drag to fwd/rew the video, turn the volume up/down, or pause. Pretty basic stuff, and it works well. pictures: Again, the story here is really the beautiful screen. You can browse your pictures via folder name or date, and then watch a slideshow or flip through them manually. They look wonderful. Even more impressive, though, might be the speed at which you can flip through your pictures. The Zune HD is quite simply the most responsive handheld device I’ve ever owned. Thanks to the Nvidia Tegra processor, I imagine, and some very clever programming. You can literally flip through them as fast as your fingers will move, and then pinch to zoom (etc) that folks have come to expect. Lastly, you can long-press a picture (or folder) to delete it, “pin” it, or (in the case of a single photo) make it your slide background. radio: Like all previous Zunes, the Zune HD offers built-in FM radio, which only the most recent iPods have begun to offer. One of the selling points of the new Zune “HD”, however, is the inclusion of HD radio, which advertises ‘CD quality’ radio reception. Having listened to HD radio in my commuter car for the past year or so, I can honestly say that it does sound noticeably better than standard FM radio. It also offers the (very handy) ability to include the artist/song/album name info in the audio stream, which is nice. Like other views on the Zune HD, the ‘now playing’ page for radio gives access to a number of handy functions. Notably, you can quickly add a radio preset, access your existing presets, and add the current ‘song’ or ‘show’ to your cart for later downloading on the Zune Marketplace. With an HD-enabled station, you can also swipe left or right to change between their HD offerings. All in all, if you don’t listen to much FM, the HD radio offering may not float your boat a whole lot. It is a very nice feature, though, and well implemented. marketplace: Building off of the 2nd generation Zune functionality, the Zune HD has full wireless access to the Zune Marketplace. Launch the Marketplace and you are greeted with (4) basic options: Music, Apps, Search, and Cart. The ‘Music’ option takes you to a nice thumbnail view of the newest album releases, or you can swipe left/right for Top Songs or Top Albums. ‘Apps’, as you might expect, let’s you view all of the Zune apps for immediate downloading. There’s like 7 apps total right now, so it’s pretty silly. ‘Search’ looks like a typical browser search area, and brings up the Zune HD virtual keyboard. Type in your search terms, hit Done, and away you go! Everything that the Marketplace has available is at your fingertips – for streaming (Zune Pass) or purchasing via the ‘Cart’. I would imagine that you can purchase immediately if you have Microsoft Points in your account, but I have not tried that. internet: It came as a bit of a surprise to many folks, but the Zune HD features a very capable browser. Given what Windows Mobile has offered up in terms of browsing, not much was expected in the regard, but the results are quite welcome. 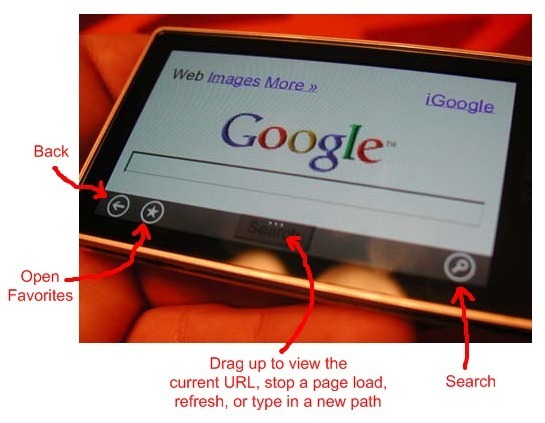 The IE6-based Zune HD browser is nice to look at, relatively fast, and features the typical mobile browser controls you’ve come to expect: pinch to zoom, move around with your fingers, and so forth. The browser interface is, shall we say, very spartan. There are about (4) controls to see, and much of that is tucked away at the bottom or transparent. When push comes to shove, you realize that the “bare bones” interface is really all you need in a mobile browser: hitting Back, managing Favorites, Searching, and then interacting with your current URL. It seems almost too simplistic, but what else do you need to do that cannot be handled with those basic controls + screen manipulation? It’s very efficient, and the browser engine is surprisingly capable. Aside from the Marketplace search, the browser is really one of the primary places in the Zune HD where you’ll use the virtual keyboard. While I don’t have hours of typing under my belt on the Zune HD, my initial reaction is that the keyboard is quite capable, and in many ways better than what is on the MyTouch 3G. It seems to be responsive and very accurate. In fact, I did a test type between the two devices, typing “echo and the bunnymen”. I had one mis-typed letter on the Zune, and I completely mangled “bunnymen” on the MyTouch 3G, which I have far more experience typing on. Guess that says something. apps: This is certainly a point of contention amongst many reviewers and interested buyers: What is the app support on the Zune HD? To be perfectly honest, the current support is poor. Microsoft has not announced a long-term plan for what type of app support the Zune HD will have, and so we’re left wondering… and tinkering with the handful of launch day apps. Let’s see, I have a calculator, a weather app, and some games. While they all look very nice, they take a bit too long to load, in my opinion. What would be nice to find out are the long-term app plans for the Zune platform. Will we get XBLA games ported to the Zune? Will there be a full app marketplace with 3rd party support? I would be very surprised if Microsoft left the apps as they are currently, but without any official word from them, I can only remark about the present state of things. It’s pretty sad, but at least a small step forward from the previous iteration of Zune hardware. A very small step. settings: I’m not going to spend too much time with this. Need to adjust your wireless link? Try out a different EQ setting? How about set a lock screen PIN? It’s all here. Enjoy. A nice interface is nothing if the infrastructure doesn’t support it well. The Zune HD could dance and twirl all it likes, but if it feels like the hardware is constantly chugging to keep up with you, well… the experience would be less than ideal. Thankfully, the performance is top-notch. I don’t know a whole lot about the Nvidia Tegra processor, but I get the feeling that this is a nice piece of hardware. Either that, or the Zune team is a crack squad that can produce blood from turnips. Whatever the case, the Zune HD moves along at a clip that is nothing short of wonderful. Screens emerge quickly, transitions are smooth, and scrolling is seamless. 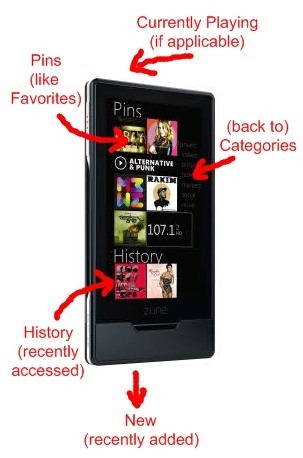 If anything, my experience with the Zune HD has been eye-opening. This is how mobile devices are supposed to be: fast and fluid. HTC and the WinMo team need to get together and get this Tegra processor into all of their upcoming phones. Seriously. This is good stuff. The Zune HD is rated at up to 33 hours for music and 8.5 hours for video. These numbers are, of course, under the most ideal conditions – wireless off, screen off (music), and not fiddling with things. Evidently, the Nvidia Tegra processor is known to be both powerful and power-sipping. The verdict is still out on the battery life of the Zune HD, but I can’t say that I’m completely blown away just yet. If I’m listening to music for 5 hours and barely see the battery meter change, then I’m impressed. As it stands, the battery life seems to be decent, but not incredible. So, this “quick review” is not especially quick, but what can you do? There is a lot to talk about with all that is wrapped up in this tiny package. Is the Zune HD the best personal media player out there? I say “yes”, with no hesitation whatsoever. If your goal is a great music listening experience, then the Zune HD is the best of the best. Hands down. If you’re a Zune Pass subscriber, then the whole package just becomes that much better. What about video support? Well, I still say that the Zune HD is wonderful for watching video, but at 32gigs max (currently) you’re only going to fit so much content on here. What you have will look great, thanks to the beautiful OLED screen. No doubt about that. What about app support? As it stands right now, the Zune HD is *not* your best choice for apps. If you want a large selection of games, map finding apps, or something to produce bodily function sounds, then another device is a better bet for you. That said, I’m hoping that Microsoft knocks our socks with some amazing Xbox/XBLA integration in the very near future. C’mon, guys! What else? Quite simply, there is not a nicer looking media player on the market today. The form-factor is great, the interface is amazing, and the whole package is extremely well thought out. 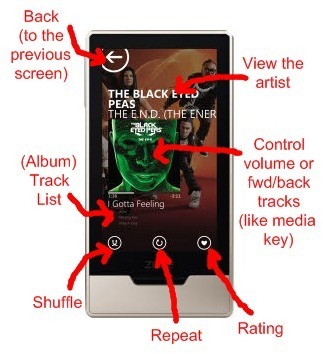 From the wonderful navigation to the beautiful screen, the Zune HD has many features that the competition need to be seriously considering. With exception of app support, the Zune HD has raised the bar. So, we’ve had our Xbox 360 for about two years now. Something like that. 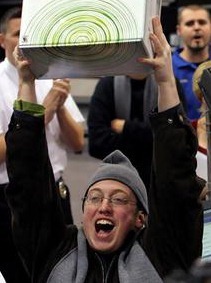 We inherited our Xbox from my brother who had purchased it at “launch” in late 2005. When he upgraded to the “Elite” model two years later, we were more than happy to take his hand-me-down system. Well… I was happy. My wife was less enthused. But that’s another story. Anyhow, our hand-me-down Xbox 360 crapped about at around the 3-year mark from original purchase. We had had it for a year or so. Because it sounds like a small jet engine, we’ve always kept it in our TV cabinet with the doors mostly closed. 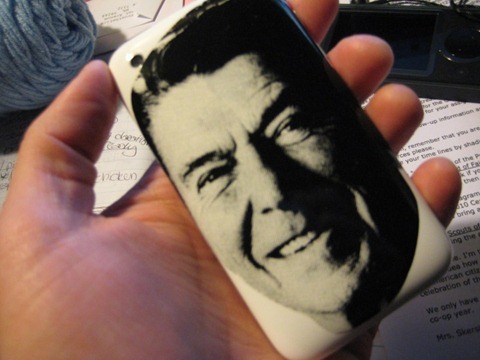 It was never really an issue until the infamous RRoD popped into our world one day. We were heartbroken. Thankfully, Microsoft saw fit to extend the warranty to (3) full years for this particular issue, and ours was sent off for repair with little fanfare. What we received in return was a refurbished unit. Oh, well. Beggars can’t be choosers. The honeymoon quickly faded within the first week. Back in the old TV cabinet again, this Xbox 360 soon exhibited the ‘2 Rings of Death’ behavior which tells you that the unit has overheated somewhat. The story appears to be something like this: the original (and somewhat poorly designed) internals of the X360 ran at much higher temperatures, but would eventually succumb to internal damage that would result in broken solder joints, separated heatsinks, or what have you. The newer units have lower tolerances for heat, and thus display the ‘2 Rings of Death’ when the unit would get too hot. Less damage to the system is a good thing, but having to shut the unit off after an hour can be aggravating. Worse yet, we realized that we really needed to open our TV cabinet when the Xbox was on, which only made the entire room obnoxiously loud. We also experimented with better airflow around the unit, standing it up vertically, and moving the power supply further away. All helpful, but (evidently) not enough. About a month ago, our year-old “refurb” X360 began to exhibit ‘video artifacting’ and freezing. After some time in the penalty box, we could turn it back on and resume our entertainment. Still, it was unnerving and it seemed to only be getting worse. Finally, it gave way to a full-blown RRoD. Clearly something had to be done, so I weighed our options. For $99, we could ship the unit off to Microsoft for repair. For $199, we could buy an Arcade unit and re-use our current harddrive. For $35, we could “fix” the most likely x-clamp issue. I also considered sending my Xbox 360 off to one of many vendors who will repair the unit for you. It does cost more, but they typically offer a short warranty on their work. Ultimately, I was less enthused about the added cost. As you can see from the options I’ve listed, my primary concerns were: price, reliability (over time), and noise. Pretty much in that order. Eventually, I decided that $90 wasn’t too much to spend, and I liked the potential for long term reliability and reduced noise. I jumped on that option. My vendor of choice was Llamma’s. They not only had decent prices on the parts I needed, but also had some great repair write-ups for me to follow. The parts arrived a few days early, which was nice, so my son and I dug right in. The Llamma’s RRoD Fix-It Tutorial gives a nice step-by-step write-up, complete with pictures. While this “fix” isn’t difficult, per se, it does require some bravery on your part. First of all, this will void your warranty, if you still have one. If your Xbox 360 is still under warranty, then by all means have Microsoft repair it for you. Might as well. Otherwise, a RRoD Xbox 360 isn’t going to get a whole lot worse by you cracking it open and attempting a repair – assuming that you’re mindful of the task at hand. Having built and re-built hundreds of PCs over the years, I was fairly comfortable with the task. Fairly comfortable. Secondly, there is some “modding” required for the x-clamp fix. The deal is this: Microsoft uses tension-based x-clamps to keep the heatsinks pressed tightly against the CPU and GPU, respectively. Those clamps can loosen over time, thus the cooling degrades. The x-clamp fix involves removing the x-clamps themselves, boring out (8) holes, a using a series of screws and washers to reattach the heatsinks. Still feeling brave? Then continue on. Lastly, you’re probably best off having someone help you with this process – if only for the second pair of eyes. Some steps are slightly tricky, especially the first time through. Having someone help you is a good safe-guard against doing stupid things. So, I was somewhat surprised to find that opening the Xbox 360 is actually one of the more complicated portions of this process. Thankfully, Llamma’s provided both a very handy tool for the job (included with the All-in-One Kit) *and* a good write-up to help me along. Once the case is off, you wind up with a metal plate that the motherboard is attached to. You carefully pry off the x-clamps, remove the heatsinks, and prepare for the “fixing” process. Much to my surprise, I found that I already had the Elite-type GPU heatsink w/ heatpipe in our refurb unit. As it turns out, Microsoft began adding the heatpipe upgrade to their systems in mid-2007. If I’d known that, I could’ve saved myself some money + shipping costs. Oh, well. Llamma’s was kind enough to take it back and credit me. Perhaps the most unnerving part of the process is “boring” out the holes where the heatsink attaches to the metal chassis. There are (8) holes total – (4) per heatsink – and the x-clamp fix requires making those holes slightly larger. It sounds quite daunting, but is really fairly easy. Grab a 13/64” drill bit and “bore” the holes out to be slightly larger. It takes about 15 seconds per hole. Then, sand the holes down so that there are no rough edges. Easy. With the provided cleaning solutions, remove all of the thermal compound from the CPU, GPU, and corresponding heatsinks. It’s not difficult, but requires some persistence and patience. Once those are clean, prepare to reassemble your Xbox 360. As they say, “putting it back together is a reverse of the removal”. In this case, though, you are first spreading a very thin layer of thermal grease, and then attaching the heatsinks to the CPU and GPU with the All-in-One Kit-provided screws and washers. Assuming that you tighten the screws down evenly, you can really torque them down as tight as you’re able. It will get very, very snug – and that’s a good thing. With that done, you begin to carefully reassemble your Xbox 360. 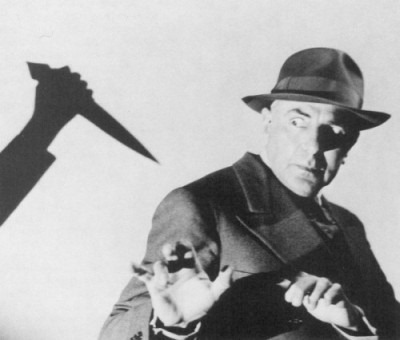 Pay attention to where things go, and be sure not to jab anything with a screwdriver. Before putting the box fully together again, however, you perform what they call a “reflow”. Without re-writing the directions entirely, you will plug the fan back in and place it directly on top of the CPU heatsink – cool air blowing downward toward the CPU. Turn the box back on and allow it to run for 30 or 40 minutes. With the fan placed like that, you are cooling the CPU but not the GPU. This is the aforementioned “reflow”, which is very important. If you get a RRoD right away, don’t panic. Simply torque the heatsink screws down a bit more and try again. In our case, the X360 came right up first shot and was working fine. Still, we let it “reflow” for about 45 minutes before putting it all back together. With that completed, you’re ready to truly reassemble your Xbox 360 and put it back to work. The last “fix”, if you will, is to swap the stock fan for the Whisper Max unit. In our case, I opted to remove all of the silly LEDs that come with the replacement fan. Your choice. The Whisper Max directions are really pretty poor, but it helps if you have the “general idea” figured out beforehand. Since this fan features both “power” and “quiet” fan modes, it requires two power sources and a switch to toggle between them. This means daisy-chaining the DVD power source (for 12v) and going direct to the motherboard (for 5v). The switch is sandwiched between the case housing and the center of one of the fans. It can be a bit tricky, so just pay attention. I removed the cap off of the switch, and glued it on after the entire box was reassembled. Also, be mindful of where your fan wires are routed. Keep them out of the way of the fan, and off to the side. So, the actual total cost came to $55 + shipping. Nice. We’ve been very happy with our RRoD fix so far. Not only is our Xbox 360 up and running once again, we’ve only seen one “freeze” over the past couple of weeks – even after assaulting it with hours of online Halo 3 multi-player action! Even better, the “quiet” mode of the Whisper Max fan is extremely useable. I’ve since moved our X360 out of the TV cabinet for better airflow, but using the “quiet” fan mode, we’re totally able to stream Netflix without the typical ‘noise annoyance’ that we used to face. In the “loud” fan mode, I would venture a guess that the Whisper Max is slightly louder than the stock fan, but is clearly pushing more air. We use that mode for gaming, where the volume is already pretty cranked. All in all, our Xbox 360 has a new lease on life, and I couldn’t be happier. Well… I guess I could. It would’ve been nice if the Xbox 360 never had the RRoD issue and didn’t sound like a jetliner, but such is life. I actually find the Xbox platform to be extraordinarily robust and easy-to-use, save for the overheating issues. 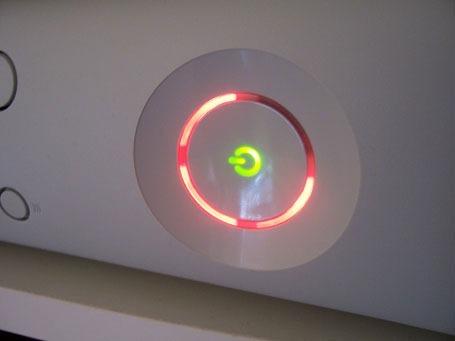 There’s a reason why so many people return to the Xbox 360 even after a unit failure. It’s a pretty wonderful platform, all things considered. Last December, I purchased the T-Mobile G1 – the very first Google Android-based handset to market. Although it seemed like a good idea at the time, we just weren’t ready for each other. The OS was in its early stages of development, and I wasn’t ready for a “learning experience”. A few months later, I sold my G1 off to some unsuspecting 20-year-old and ran back to my T-Mobile Dash. So what’s the deal now? Why am I talking about the T-Mobile MyTouch 3G? It’s pretty simple: it was time (again) for a new phone. The Dash was going on 3.5 years old, and simply didn’t offer what I needed – better speed, a touchscreen, and a “fresh face”. I kicked around the notion of getting another WinMo device, but the phones that I really wanted were pretty darned expensive – even purchasing them “used”, which would’ve left me without a warranty. 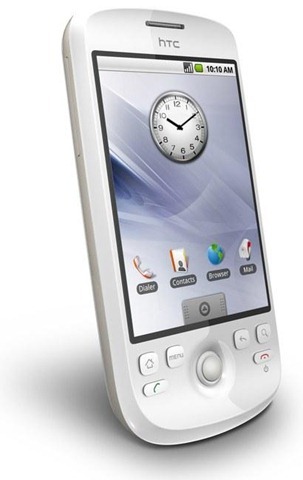 The MyTouch 3G (MT3G) release date was just around the corner and it piqued my interest. A slightly larger ROM size (vs. the G1), smaller form-factor, bigger battery, and – most importantly – an OS that has matured since the G1 launch. After checking out the early reviews, I decided to place a pre-order and renew my contract for another 2 years. T-Mobile really upped the ante in the production and marketing of this phone. The packaging is impressive, and comes with a nice zipper case, adapters, chargers, and most everything you need – including a screen protector, if that’s how you roll. It feels like T-Mo put some real thought and effort into making the MyTouch a successful product – beginning with the launch, and (hopefully) followed-up with good, long-term support. We’ll see. The MT3G is a very nice looking phone. It looks decent enough in online reviews, but much better in person. I have the “black” variety, but (evidently) the “white” and “merlot” look very nice as well. Your choice. This is also a very sturdy handset that feels good in the hand. While it’s smaller than the G1 – mainly due to losing the physical keyboard – it still feels very well-built without feeling heavy. In fact, it’s roughly 25% lighter than the G1, which is nice. The back of the casing is smooth without feeling dangerously slippery. The buttons are of good quality, save for the trackball which always feels cheap to me – whether on the G1, MyTouch, Blackberry, or whatever. Personal preference, I guess, because a lot of people seem to love them. All in all, the MT3G gives a good first impression. I just gotta say this: “MyTouch 3G” is a truly horrible name. I feel silly typing it, and I’m embarrassed to say it out loud. They’re really pushing this “my” thing – make it your own, each is unique, etc. — and I understand that completely, but “myTouch”? Aside from the hardware changes (as compared to the G1), the MT3G is sporting the newest revision of the Android OS — version 1.5, dubbed “cupcake” – which is also what G1 owners have automatically upgraded to. This is certainly more of an evolutionary upgrade to the Android operating system, but they’ve made some very good changes. The “onscreen keyboard” was a must and really works very well, voice recognition is in there, an updated browser, video recorder, stereo bluetooth support, and a lotta bug fixes. 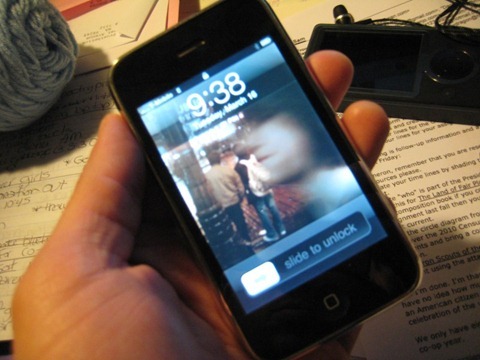 Essentially, it’s keeping pace with the likes of the iPhone, which isn’t an easy task. That said, considering that this OS is less than 1-year old, Android is a pretty impressive feat – with more features coming this year! I’m not a huge fan of Google, to be honest, but for the anti-iPhone person out there (like me! ), Android is one of the best options out there. Perhaps equally as important to the long-term viability of the Android OS is the 3rd party support. What the OS lacks in features/usability is often compensated for with downloadable apps, utilities, and other such “niceties” that make Android just that much better. Case in point: I initially begrudged Android for how many clicks were required to simply call the ten people I spoke to most often. With a free application like ‘Any Cut’, however, I can easily make shortcuts on my home screen to those contacts/numbers. In other words, what used to take 9 clicks on the phone, now takes only 4 – which is much more inline with what I’ve been accustomed to on my T-Mobile Dash. Quite simply, the app support for Android is growing – and continues to grow on a daily basis. While most of the stuff is useless, there are many handy utilities that I really rely upon now. Locale – great for setting phone conditions based upon certain criteria. For instance, when the GPS detects that I’m “at work”, then set the phone volume to 50%. How cool is that? HTC Keyboard – although the standard Android virtual keyboard is good, the HTC variant is even better. Any Cut – put handy shortcuts to most anything… right on your desktop! VirtueBible FE – this free Bible reader is really well made, which markers and memorization support. SMS Popup – I really like the way this no-frills, free app handles incoming SMS/text messages. Should be built into Android! Robo Defense (Free) – a super-fun tower defense style game. 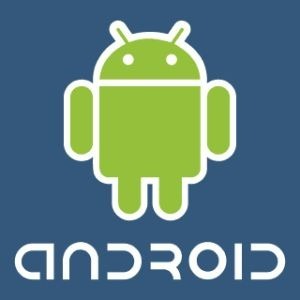 Android has more work to do to be the “de-facto mobile OS”, but they’re making great strides with very good community support. Consistency: I had made some initial dings against Android in the area of “consistency”, and sadly I think that this (for the most part) still holds true. There are still those occasions when the trackball is necessary, when a long-press doesn’t exist, and when hitting the MENU button does nothing. More than anything, I guess, you get used to these things. Every operating system has its “quirks”, and Android is no different. 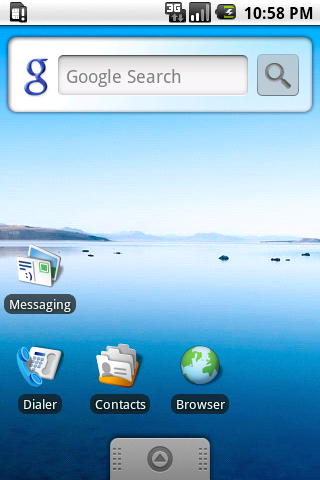 Home Screen Area(s): I had also complained that the Android home screen – which is broken into a “virtual desktop” type arrangement – would typically be unknown to the casual user. This is still the case, of course, and many updated ROMs are taking this even further – with 5 or 7 virtual desktops! Chock this up to a “feature”, I suppose, as it’s just how Android functions. 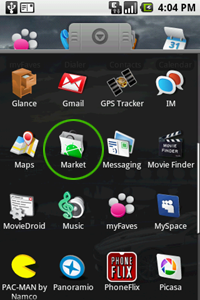 Notification Bar: The top portion of the home screen houses the “notification bar”, where items like missed calls, voicemail notices, and text messages go. In the early build of Android, it seemed like ‘swiping’ this area down to view it was somewhat iffy. Be it a software or hardware change, this really appears to be much more responsive on the MT3G. Menu: Bringing up the menu to get to your applications is something a lot of folks will do quite frequently. If you have tons of shortcuts on your desktop, then I suppose you may see the menu less than most, but I’m guessing that 90% of installed apps are still launched by opening the menu, scrolling, finding the icon, and tapping it. Sadly, the performance of the menu is still pretty pitiful – and I’m not sure why. Whereas the notification bar is very smooth, the revealing of the menu is choppy and distracting. Hopefully the next version of Android will resolve this, as it’s a fairly noticeable portion of the OS. Performance: I know that the Android team has gone to great lengths to improve the all-around performance of this OS, and it’s really paid off. The basic functions: phone calls, messaging, email, etc., are quite snappy. The occasional app can still bog the phone slightly – certainly noticeable when downloading/installing a new app – but for the most part it all moves and responds well. I rarely feel a need to restart my phone, as it almost seems to move better over time. Nice! Dropped Calls: During my brief (few month) stint with the G1, I had an noticeable increase in dropped calls. Hardware issue? OS? 3G network? I’m really not sure, to be honest, but the MT3G has performed very well in this area. Maybe 1 dropped call in the past few weeks? Whatever the number, it’s very low. Stability: The Android OS – as well as this phone – continues to be very stable, with very few applications “hanging” or requiring a force close. This was mostly a non-issue before, and it continues to be so. Quick Dialing: As I noted previously, the default dialing experience with Android (and other “full-featured” phones, to be honest) leaves a bit to be desired. Unlocking the phone, finding a person, clicking on their name, and selecting/dialing their number seems to take way longer than necessary. This is my opinion, of course, but such a basic function should be much easier. Thankfully, apps like Any Cut allow you to make shortcuts to particular numbers for particular contacts right on your desktop. In my case, my left-hand virtual desktop is dedicated to my “speed dial” and “speed message” favorites. Unlock the phone, swipe to the left, and click the icon. Done! Voicemail: With my G1 phone, I had noted that something seemed to receive a “voice command” while I would be checking my voicemail. I don’t know what the deal was there, but it happened fairly frequently. With the introduction of the MT3G, T-Mobile has also introduced a long-needed functionality: visual voicemail. As a downloadable app (free), I can simply launch Visual Voicemail, look at the list of voice messages, and play whichever one I like. I can rewind, fast-forward, or delete them as I please. The biggest gripe I have right now is that the Visual Voicemail app doesn’t pipe audio out to my bluetooth headset, when connected. Strange, but not the end of the world. I also assume that they’ll fix this is a coming release. One of the most exciting things about Android + HTC devices is the ability to “root” and install 3rd party ROMs. In fact, this really contributed to my leaning toward another HTC phone. Although my Dash was initially easier to load up with a 3rd party ROM, the MT3G is probably even easier with the 1-Click Root method, which I’ve taken full advantage of. At this point, I can download any 32B-compatible ROM from the XDA Developers site, copy the .zip file to the SD card on my phone, reboot, and install a new ROM. Those are slightly oversimplified steps, but not by much. Seriously. The most impressive ROM I’ve used so far is the eViL HeRo v1.6xb ROM, which is really fun to look at, but has some performance issues on this hardware. Thankfully, HTC has revealed a *very promising” Hero update that oughta resolve many of the performance updates with this version of the Android OS. I’m really looking forward to that, and will dedicate a separate write-up to that experience. In addition to the 3rd party ROM support, one of the most impressive features of the Android OS is the ability to really customize and make it yours. Not to rip into the iPhone too heavily (you already know that I’m no fan), but every single iPhone I’ve seen looks the same – save for the wallpaper. It’s a screen with 16 icons or so, flipping to the right for more icons, and on and on. Very boring, if you ask me, but that’s the Apple world – absolute control over the user experience, which (in all honestly) has served them well. It’s not what I want, though. I want my own world where I can tinker, fiddle, customize, and make it unique. I do this on my computer desktop, and I want the same with my phone. The WinMo world offered this, and (even more so) the Android OS does as well. 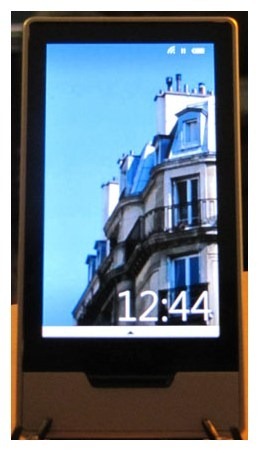 Call me crazy, but I’m quite happy with the MyTouch 3G phone – name aside. 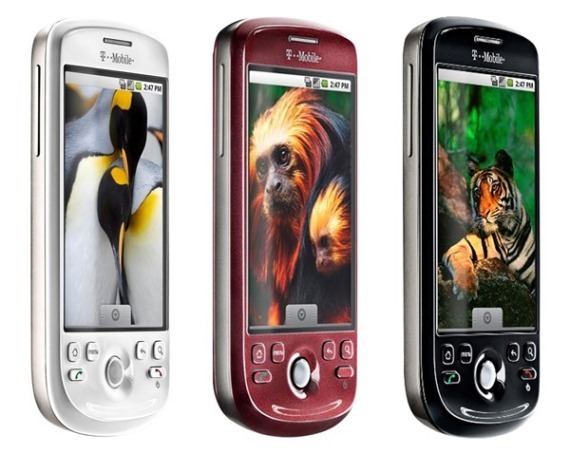 This is an attractive, fun-to-use, well-built phone that really competes well with the likes of the Palm Pre and iPhone. I mean that very seriously. With several more Android-based phones due out this year, prepare yourself for the onslaught. You’re going to be seeing a lot more “Google phones” from different carriers. That is ultimately a good thing, as the OS and app support will continue to thrive, but also means a certain “loss of exclusivity”, which has thus far really belonged to T-Mobile. Still, I’m quite happy with this phone right now, and it will certainly keep me happy until I find out what Microsoft has in store with the upcoming WinMo 7. Hot off the presses… a fun little slideshow from our recent family vacation. Wow! It really is “Comcastic”! We’ve been using Verizon DSL at home for the past 6 years or so. They’ve been good, quite reliable, and reasonably priced. Recently, though, we’ve had the “need for speed”, and Verizon just couldn’t come through. We were paying for 3mbps (down) / 768k (up), but only really realized about half of that speed. We were too far from the CO to get any faster. Verizon DSL couldn’t do any better for us, FiOS isn’t available in our area, and everything else was either 1) only comparable on speed, or 2) just too expensive. Who saves the day? Comcast. For $19.99/month for the first 6 months (+ $60 install fee), we decided to bit the bullet. 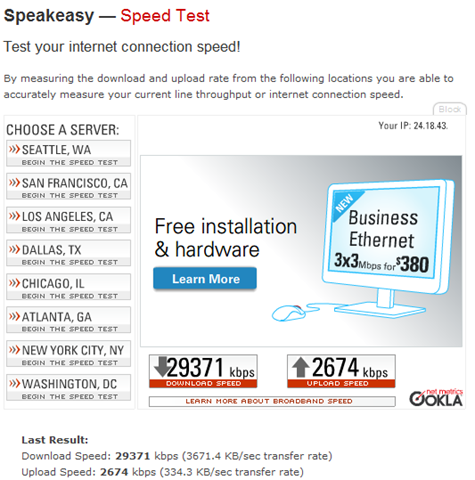 I’ve never been a huge cable Internet fan – fluctuating speeds, rumors of numerous outages, etc. – but I’ve never had cable Internet either. We setup an appointment to have them out between 8AM and noon today. Yeah… that’s 29mbps (down) / 2.6mbps (up). Whoa! I realize that those speeds will change with additional users online in the neighborhood, but still… that’s pretty amazing.